Back in 2009 I received a letter from Jamie Ward congratulating me on my new appointment at F&C and introducing himself and the furniture crafts courses at Warwickshire College. I hadn't been at the magazine for long, a few weeks perhaps, and had a whole bunch of new tricks to learn. I filed the information with a whole load of other stuff and carried on with the job. 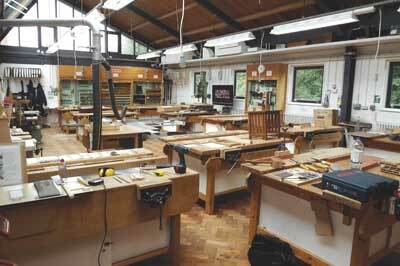 A few months later, I happened to bump into Jamie at an Axminster Talking Tools event held at Rycotewood College. We talked and I said it wasn't out of the question to expect a visit some time in the future to see the students at work. 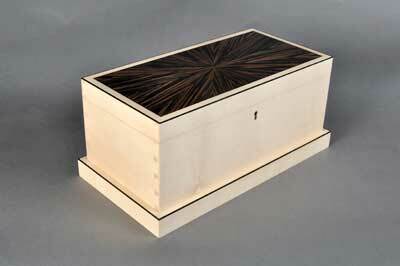 Four years on and a couple of unscheduled meetings at New Designers, and I'm glad to say we finally got round to it. You could argue it was only a matter of time before we made the trip as part of our ongoing series looking at state-funded institutions for the next generation of furniture makers, but it was a link to an online gallery of work completed by students on the 2013 course that finally led me to make the trip. 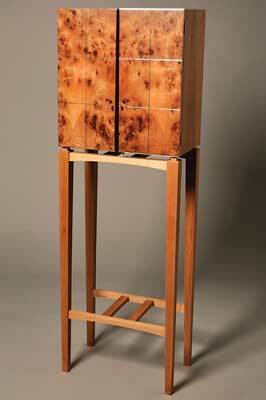 The piece that caught my eye was a cabinet by Jan Waterston. We featured it in F&C 212 and the same cabinet earned Jan the 'Alan Peters Award for Excellence' at this year's Celebration of Craftsmanship & Design at Cheltenham. It's an outstanding piece of work for someone so young and something that Jan, Jamie and Warwickshire College should be extremely proud of. Jan's achievement is one of many that singles Warwickshire out as something special in my book. There are institutions that are better known, some claim to have national status and there are plenty with significantly higher funding. One or two have media/PR departments and a budget for marketing, which, if I'm honest, feels slightly out of place. In many ways adopting a business-like attitude to cope with the commercial aspects of maintaining a course at all is highly commendable, inevitable even but also quite wrong if it takes over. 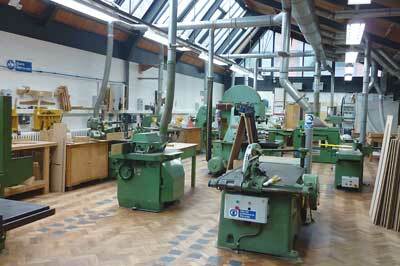 The part of Warwickshire College that is home to the furniture crafts courses was built in the 1960s but a recent programme of modernisation has largely done away with any signs of ageing. During a period when some fairly horrific examples of municipal buildings were erected, the Leamington Centre has signs of character and great style. The workshop and studios are bright open spaces with masses of daylight from the vaulted roof that, during the summer months, must feel like working outside. Many of the machines are in exactly the same spot as they were when first installed, making the workshop a time capsule from a period when craft skills were more widely appreciated. For prospective students, don't be fooled by glitzy modern equipment. Brought up to modern spec, these 50-year-old machines are every bit as capable as their modern equivalents. Ask any old hand. Warwickshire College has gained the respect and support of a number of established professionals over the years: Andrew Varah, Sean Feeney and Neil Stevenson have all had close relations with the college. 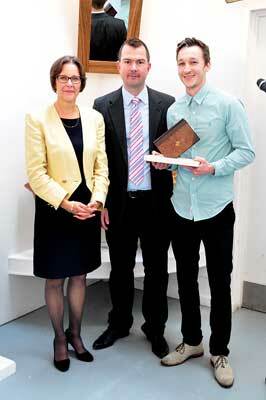 Jan Waterston was also the first recipient of an award in memory of Andrew Varah, who died in July 2012, for which he was awarded outstanding student of the year. I suspect the secret behind the success of Warwickshire's students has something to do with Jamie's background as a trained furniture maker and joiner. 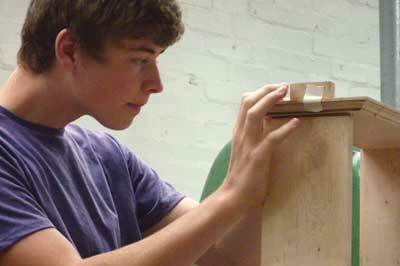 Jamie started at Warwickshire College as a 16-year-old apprentice, then went into the joinery industry. He became a supervisor at the age of 19 and then, at 26, he retrained and went to Bucks New University, or Bucks College, as it was then called. "While I was at uni, I worked for Richard Williams and Hands of Wycombe and spent five years at university completing my HND, and then three years on the degree. I completed my degree with colleague Oli Renison, who is now our technician instructor. Our furniture course would not run as smoothly without him. I returned to Warwickshire College first as a part-time tutor teaching on the evening classes, then as a full-time technician instructor. I became curriculum leader in 2008." 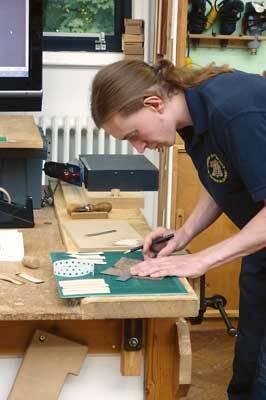 The level of education on offer at Warwickshire is up to City & Guilds Diploma Level 3. The courses are run as either two or three full-time days per week over one or two years, often in conjunction with an apprentice scheme through a local employer. The diploma course is typically the next step for school leavers and classified as further education. It also serves as a grounding for higher education at HND or degree level. The boundaries can become a little blurred as neither certificate is exclusive to any age demographic, although a student moving on from school would not expect to enrol at degree level without previous experience. The core of students is typically younger at further education level and diploma courses are generally geared towards a more practical content with a focus on developing hand and machine-tool skills. It's not until students reach degree level that the subject becomes more theory-based and experimental. With woodworking in particular absent from the school curriculum, students come to the bench a lot later in their training so it's not surprising that sometimes the build quality of some degree work can be a little off. 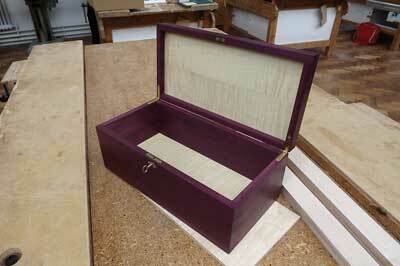 Many of these students will not have gained sufficient hand-tool skills to put into practice what they can visualise. This makes the standard of work coming out of Warwickshire and other diploma courses even more impressive given the starting point. A great number of students will never have picked up a chisel before. It would be wrong to single out Warwickshire as a special case, however, as Bridgwater and Chichester Colleges have produced some first-class students in recent years as well. 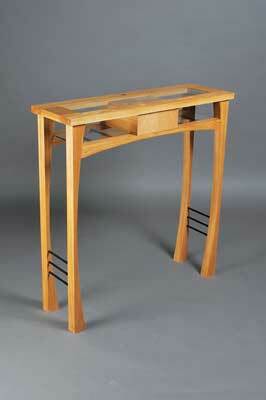 Most notably George Callow, winner of the cabinetmaking class at this year's WorldSkills Competition in Leipzig. The image of George cloaked in the Union Flag as the winner is announced remains my favourite photo of the year and is just as inspirational as any piece of furniture I've seen. What makes it special is that this is a young guy who's cut and planed his way to the top of his craft using tools that you and I can go out and buy. No carbon fibre or wind tunnels needed; just basic skills well executed. Warwickshire students have also gained recognition at professional level with Armando Magnino's work being shortlisted for the Wood Awards in 2009. 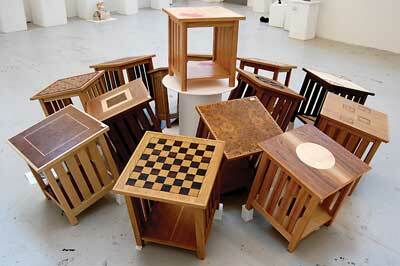 He also gained a Guild Mark when working for Robin Furlong, before he started teaching. 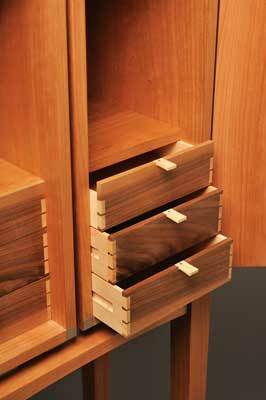 The Furniture Crafts Level 3 course would also see Gary Ramsden receive a City & Guilds gold medal for his final piece of course work in 2011. The Furniture Crafts City & Guilds course follows a rigid path of set pieces in the first year to develop the necessary skills to tackle more complex projects in the second year. Jamie keeps examples of these early test pieces: a 400mm square frame with a different joint at each corner. Referring back to these year on year, he can be sure that the high standard is maintained. There are a couple that are perfect and should you wish to try this exercise yourself, remember: it's hand tools only. 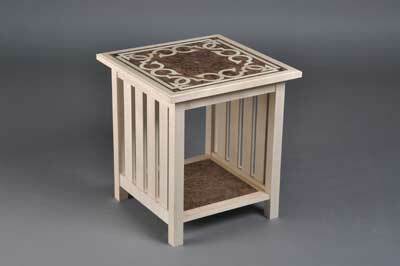 With these techniques in place, the students go on to make small items of furniture and storage solutions that include decorative features. Right now I guess my central argument is that without this attention to the fundamental techniques of marking, measuring, cutting and construction, we can expect to lose sight completely of some of the skills that have shaped the built environment and given respect and purpose to generations of craftsmen. Recognising Jamie's passion for teaching practical skills, The New English Workshop selected Warwickshire College to host a unique international summer school in July 2014. The event will see Christopher Schwarz, author of The Anarchist's Tool Chest and a devoted hand tool user, teaching two separate classes over eight days to build a full tool chest and a smaller Dutch chest. This will be the first time Chris has taught in the UK and spaces for fee-paying students will be restricted as provision is being made to include students already enrolled on a course at the college. We'll have more details of this event next month.